The new & improved WalkyDog Plus® dog bike leash lets you safely take your dog with you on bike rides. Now you can bring your best buddy along for the ride and maintain complete control; no more feeling guilty for leaving them at home. 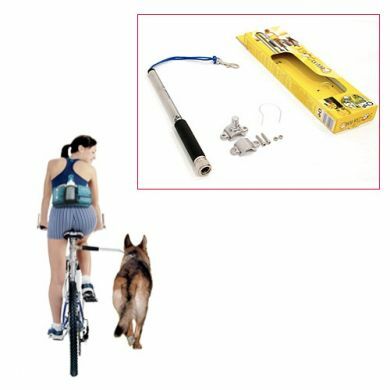 A dog bike leash is a great way to exercise your dog and release energy - especially for active dogs. The WalkyDog installs in just minutes and is incredibly easy to use. The WalkyDog Plus features a patented internal spring system that acts like suspension when your dog pulls - biking your dog has never been easier. It puts you in control - not your dog. Its patented design includes an the internal shock-absorbing system and quick lock and release capability for easy switching between bikes. The clamp is adaptable to diameters between 1 - 1.5 inch and should fit any bicyle. If you've got a smaller dog, you can add the Low Rider attachment for a more comfortable run for your dog. If you've got multiple bikes, save yourself the hassle of moving the Walky Dog by getting a Spare Jaw attachment. With our husky x, our work was cut out for us in the exercise department! Two walks a day just wasn't cutting it, so I decided to invest in the WalkyDog (and a bike!) to really wear him out. It's solid, well made and I love the shock absorbing qualities. It took our dog a little while to figure out what was going on but after about 5 minutes he had it all figured out - helped along by my constant encouragement ("Come on, boy! Come on! Run! Good boy! "; I was that person riding past people's houses talking to herself). Pup pulled a fair bit, but I barely felt most tugs and I never felt like I'd lose control of the bike. Read 8 customer reviews of Walky Dog Plus Bicycle Leash. The average customer rating is 4.6. Fantastic. Loved it. Truman our very large Groodle loved it too! The Walky Dog is not flimsy, the metal parts feel like good quality. It can attach either side of the bike, be angled variously & is easy to put on and tighten with the allen key provided. Internal springs are adjustable. My dogs have not needed special training for being on the Walky Dog. Easy to Mount and great quality. However the main pole structure interferes with your leg cycle as your peddling. This can't be helped as if you notice as your riding or see someone else ride, their hamstring/back of the thigh cycles past the seat post point. I've tried this on both the road and mountain bike I have with the same issue. But this product is excellent in all other aspects and I think it's a great for someone who's concerned about their K9 crossing in front of their path as this eliminates this possibility :) thanks for stocking this product. This is absolutely wonderful, I love to be able to ride with the dog and this makes it so much easier. I can keep the bike steady and dont have to worry about her pulling me over. So easy to install on the bike, took me alll of 5 minutes and we were away. Brilliant!! Poppy, my little Jack Russell loves it. It was really easy to fit to the bike, although Poppy doesn't pull at all usually, the other day she did because she wanted to sniff where she knew there was a mouse hiding :) I couldn't feel her pulling at all which amazed me because although she isn't a big dog she is quite strong. Excellent product. Easy to secure to bike. My German Shepherd is a puller but the Walky Dog Bicycle Leash stops her in her tracks and I even have a second secured to the other side of my bike for our Belgian Shepherd puppy. I am able to handle both and travel a good distance in a short period of time. Great idea.